Folding locks are a fairly new and increasingly popular choice when it comes to securing our bicycles and they provide a couple of big advantages over more traditional u-locks and chains. They’re made from a series of metal plates, connected by rivets. These rivets allow the plates to rotate, so that the lock can be shaped around loads of things when you’re trying to lock-up and folded down to a compact package that’s easy to carry when you want to ride off! They do tend to be slightly lighter than most other u-locks offering similar levels of protection (and internal space) and are much lighter than chains. But more importantly, while they won’t give you much more internal locking space than a standard sized u-lock, their flexible shape means you’ll be able to lock your bike in places that you wouldn’t be able to access with a u-lock. 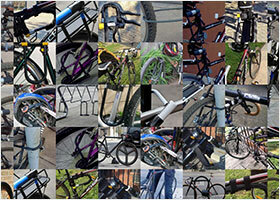 … but the flexible shape allows you to lock your bike to loads more things! 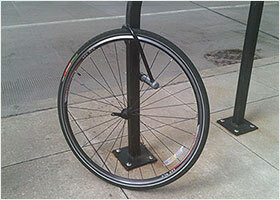 You’d never be able to lock 2 bikes (including wheels) with a standard sized u-lock! And anyone who’s ever struggled with a u-lock frame mount that’s not able to hold the lock quietly or securely will really appreciate the tight, noiseless fit of a folding lock against their frame! No rattling, no movement and no doubts over how long it will be until the lock falls off the frame! If you prefer to carry your lock in a bag, the compact shaped of a collapsed folding lock takes up much less space than a u-lock, so is much more practical. They’re slightly more fiddly to use than either a u-lock or a chain: it takes a little bit longer to unfold a folding lock and then get it round your bike and whatever you’re locking it to. And because their construction is more complex, they’re less likely to function as well after they’ve repelled a vigorous attack. Damaged rivets or bent plates won’t stop the lock protecting your bike, but they might stop it folding up properly! Most importantly, folding locks are generally at the lower end of the security ratings that they’ve been awarded. So they tend to be slightly less secure than u-locks that have the same Sold Secure ratings. This is because the plates are thinner than u-lock shackles and the rivets are susceptible to attacks with drills or bolt cutters. If ease of transport is a big issue for you and/or you like the extra locking options the flexible shape gives you, then a folding lock is an excellent choice. The question is which one should you buy? How do I decide what strength lock I need? If two or more of your answers are in the “High Risk” column, then you’ll need a lock that offers a higher level of protection. If two or more of your answers are in the “Lower Risk” column, then you might be able to get away with a lower security lock. How do I know how secure a lock is? I cover this in much more detail in my full guide to choosing a bike lock. But essentially we can use the ratings of the independent third party testing houses Sold Secure and ART. Both these organisations test and rate a huge variety of locks and rate them according to their security levels. Sold Secure rate locks as either Bronze, Silver as Gold (with Gold obviously the most secure). While ART rate locks with 1 to 5 stars (with 5 stars the most secure). ART tends to be more demanding in their testing than Sold Secure. Hence, 2 stars from ART is roughly equivalent to a Silver rating from Sold Secure. However, Sold Secure test far more locks than ART and for this reason I prefer to use them as my benchmark. But there’s no reason why we shouldn’t look at both ratings when they’re available! So, if you’re “High Risk” in the table above, then you need a lock with a Sold Secure Gold rating. Whereas if you’re “Lower Risk”, then a Sold Secure Silver rating should be enough. I don’t recommend any locks that have a Sold Secure Bronze rating as I don’t think they offer enough protection. So you already know you want a folding lock because of the advantages they offer over u-locks and chains. And now you know what security level you need. The next step is to choose a specific lock. And with folding locks, this is pretty straightforward: because there’s not much choice! 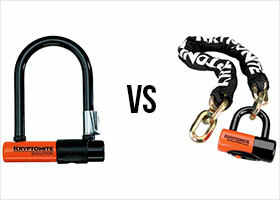 Unlike u-locks and chains, there aren’t a huge amount of different folding locks to choose between. And if we’re looking for locks that have either Sold Secure Silver or Gold ratings then there are actually very few indeed! There are just three companies making folding locks that have been tested and rated Sold Secure Silver or Gold: Abus, SeatyLock and TreLock. 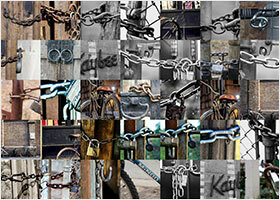 Abus are one of the biggest and well known lock brands in the world. They have a good reputation for quality and durability. And until recently they have pretty much dominated the folding lock market. They produce a variety of folding locks but only the Abus Bordo 6000 has a Sold Secure Silver rating and only the Abus Bordo 6500 has a Sold Secure Gold rating. Seatylock is a newer company whose sole focus is folding locks. They produce two distinct types at the moment, the Seatylock which is innovative design to combine a bike seat with a lock and the Foldylock which is a more standard folding lock design. 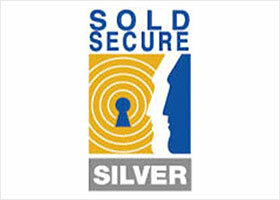 Only the Foldylock Classic and Compact have Sold Secure Silver ratings. And they don’t produce a Gold rated lock at the moment. Trelock are (like Abus) another well established German company that have been manufacturing locks for many years. They produce several folding locks including two that are rated Sold Secure Silver (the FS 450/455 Cops and the FS 460 Cops) and one which is rated Sold Secure Gold (the FS 500 Toro). While I have used both the Abus and Foldylock devices extensively, I haven’t used Trelock locks at all but have heard mixed reports about their construction quality and reliability. So for me the choice is between Abus and Foldylock. The Bordo 6000 is Abus’ mid-security (Sold Secure Silver) folding lock and it comes in three different lengths: 30″, 35″, 47″ (75, 90, 120 cm). Apart from their different lengths, these locks are identical in construction. Whereas the differences between the two Sold Secure Silver Foldylocks: the Compact and the Classic are slightly more pronounced. Yes, they’re different lengths: 33″ and 37″ (85 and 95 cm). But the metal links are different sizes too. The Classic has links which are wider but thinner (22 mm and 4.5 mm). The Compact has links which are less wide but more thick (18 mm and 5 mm). This enables the Compact to be significantly lighter and more compact than the Classic whilst still retaining it’s mid-security, Sold Secure Silver rating. Since people are attracted to folding locks by their transport convenience (which is greatly affected by weight and bulk), I’d say the Compact is a better choice than the Classic in most situations. Apart from having the same Silver rating as the Bordo 6000, the “sidewinder” keyed mechanism is more difficult to pick and the Foldylock team even claim that they’ve made adjustments to the rivets so the way many folding locks are attacked where the pins are sheared with bolt cutters is no longer possible! The case is designed in a way that means the lock clicks securely into place when it’s fully inserted. This means despite being held securely in place, there’s no need for a strap over the top (like the one on the Bordo 6000). Which in turn means the lock can be added and removed from the case much more quickly and easily! The Foldylock is also easier to unlock, maneuver and re-lock than the Bordo 6000. With the Abus lock, the outer link attaches underneath the mechanism so you need to unfold the middle links before you can pull the outer link downwards (and the links are often quite stiff). Whereas with the Foldylock, the outer link attaches to the side of the mechanism, so you can easily pull away from the side, in one motion when you’re unlocking it (and the links move much more smoothly as well). The smoother movement and side locking also makes the Foldylock easier to get around your bike when you’re locking up. So for me the Foldylock Compact is probably the best mid-security folding lock available at the moment. It’s the lightest and most compact folding lock that offers a reasonable (Sold Secure Silver) amount of protection. And it’s also by far the easiest to use! Well, this is a pretty easy choice as there’s only one decent, high-security folding lock currently available: the Abus Bordo GRANIT 6500! Trelock do offer a folding lock with the same security rating, but I’ve read so many complaints about the reliability of the mechanism, that I can’t really recommend it. The metal plates of the Bordo 6500 are only 0.5 mm thicker than the plates of the Bordo 6000 or the Foldylock Compact. But they’re also 7 mm wider. And the rivets that hold the plates together are also much larger. All this means that it’s not just bulkier and heavier: it’s also much more secure. You need to be careful with folding locks though. The plates are thinner than comparable u-lock shackles and the rivets are also susceptible to attack with bolt cutters or drills. So although the Bordo 6500 has a Gold rating from Sold Secure it only has 2/5 stars from ART. And in fact this makes it the only Gold rated lock with just 2/5 stars from ART, all the others have 3 stars. So yes, it’s the most secure folding lock currently available. But there are plenty of other bike locks that are both more secure and lighter! But it still folds down into a very compact package that’s super easy to transport! Remember: the advantages of folding locks are that they can be collapsed down into a very compact package that’s super easy to transport and their flexible shape give you load more locking options than rigid u-locks. I used the Bordo 6500 for a couple of months and found it really relaxed experience for these very reasons. You can read my full review here. Folding locks provide a great alternative to u-locks and chains if your priority is both something that’s easy to carry and something that gives you tons of locking opportunities when you’re looking for somewhere to secure your bike. For sure: they don’t generally offer as much protection as comparable u-locks. But as long as you’re aware of your risk level and choose your folding lock accordingly than you should be OK. If you’re low risk, I think the Foldylock Compact offers the best usability and would be my best buy choice. But the Abus Bordo 6000 is a good lock too and comes in a variety of lengths if you need something specific. If your’re high risk, there’s really only the Abus Bordo 6500. Although there are lighter and more secure u-locks than the Bordo 6500, I can’t think of any other high security lock that’s as easy to carry whilst also offering so many locking options. But please don’t go for anything less than a Sold Secure Silver level folding lock. For example, Abus make loads of Bordo folding locks that are smaller and lighter than the 6000: none of them are secure enough to use with any confidence!